Tony writes: I changed my mind. It happens. It’s not like I flip-flopped on a Congressional vote or sent a veal parm back because I really wanted chicken marsala in the first place (my mom pulled the latter at the old European in the North End in ’86 – I hid underneath the table for the rest of the meal). But in my world (or mind, at least), my culinary reversal was a big deal. It goes like this: recently, after much deliberation and testing, I concluded that I prefer stir-frying with non-stick cookware. Wait! I didn’t say that non-stick is optimum for stir frying (because it isn’t; the traditional restaurant method of crazy high heat and a seasoned carbon steel wok is still preferable); rather, I’ve decided that non-stick is the best way to stir-fry in my (and probably your) home kitchen (ie: working with a regular range and no exhaust hood). This realization represents a maturation on my part, an acceptance of my home-cooking capabilities and what produces the best results (Teflon ain’t macho). 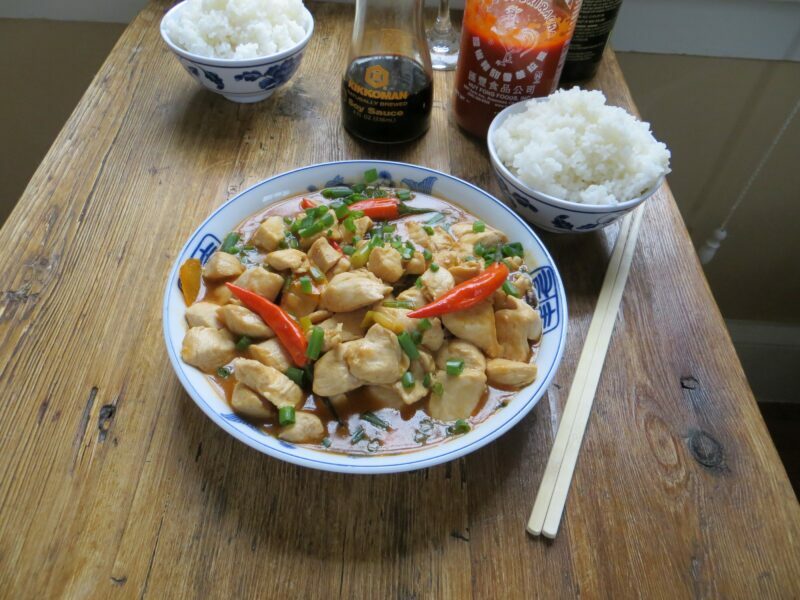 In addition to explaining how I came to this conclusion, I also share a recipe for a restaurant classic – orange chicken – jazzed up with fresh orange and a little heat. Why non-stick: I’m the first to point out the shortcomings of non-stick cookware. 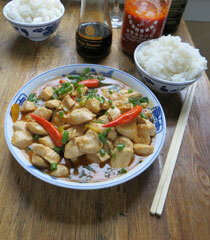 But after years of stir-frying, I’ve changed my position on its efficacy. 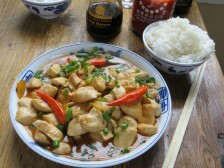 The reason for this reversal comes down to stir-frying’s dual objectives texture (tender, perfectly cooked) and flavor (browned, almost smoky caramelization; what the Chinese refer to as wok hei). It’s hard to achieve perfection with both elements at home, especially the latter – most home ranges don’t have enough Btu’s. If you’re not going to get really great caramelization, you might as well make sure the texture is perfect. You may give up some flavor in a non-sick pan (because you just can’t get and keep it as hot), but the non-stick surface does allow you to get everything in and out of the pan quickly (without incurring any sticking), which ultimately results in tender, moist texture. Also, I prefer using a non-stick skillet as opposed to a wok; more surface area exposed to the heat of a flat stovetop. Brown (but don’t cook through): The texture of properly stir-fried meats – moist, soft, tender – is almost as important as the resulting smoky flavor. To achieve this perfectly cooked moist doneness, aim to give the chicken some color on the outside, but make sure it’s well short of cooked through during the first stage of cooking (the initial sear); it will finish cooking during the final saucing stage. Ketchup and corn starch: These are both important ingredients in this stir-fry. Intuitively, ketchup should have no place in Chinese cooking, but its spiced sweetness blends into traditional sweet and sour sauces, offering up a touch of complexity. The use of corn starch can be complicated – use too much and you get a gloppy mess. A light dusting of corn starch coats the chicken and keeps it moist during searing while a light drizzle in the form of a in a slurry (a thickening mixture of corn starch and water) give this orange sauce a pleasantly rich texture. 1. 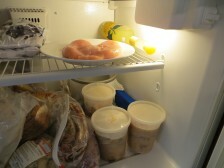 “Marinate” the chicken: Set 1 1/4 lb. chicken breast (2 medium) on a plate and transfer to the freezer to chill for 10 minutes (this semi-freezing will help it firm up, which, in turn, will make it easier to slice uniformly). 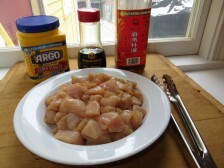 Trim any fat off the chicken, butterfly the breasts, and cut into 1-inch chunks. Toss with 1 Tbs. soy sauce, 1 Tbs. dry sherry (or Shaoxing wine), 1 tsp. corn starch, and 1/2 tsp. kosher salt. Let sit for 10 minutes at room temperature. 2. 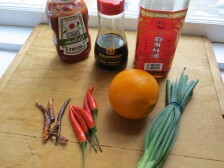 Make the sauce: In a small bowl, mix the juice of 1/2 orange (about 1/4 cup), 2 Tbs. soy sauce, 1 Tbs. ketchup, 1 Tbs. sherry (or Shaoxing wine), 1 Tbs. rice vinegar, and 1 tsp. sugar. 3. Stir-fry (sear, then sauce): Heat 1 1/2 Tbs. canola or peanut oil in a large non-stick skillet over medium-high heat until it’s shimmering hot, about 1 minute. Add the chicken and cook, stirring, until it browns in places and loses most all of its exterior raw color, about 2 minutes (it should still be raw-ish if you cut into a thick piece). Slide off onto a large plate. Add a light drizzle of oil, 3 scallions (trimmed and thinly sliced), a couple strips of orange zest (use a peeler) and 2 dried chiles (broken into large pieces). Cook until they start to sizzle steadily and become fragrant, about 1 minute. 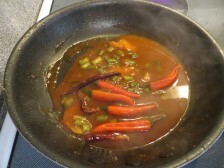 Add the sauce mixture and bring to a boil. In a small bowl, mix 2 tsp. corn starch with 2 Tbs. water (so it’s uniform with no chunks). Whisk into the simmering sauce; it should thicken immediately. 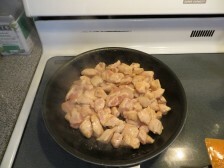 Return the chicken to the pan and cook, still over medium-high heat, tossing with the sauce, until the chicken finishes cooking through (slice into a thicker piece) and the sauce coats it, 1 to 2 minutes; add a splash of water or chicken broth as needed to loosen the sauce. Serve sprinkled with some more scallion and with white rice and stir-fried broccoli.